SCP-3417 X-ray emissions, recorded by the NASA High Energy Astronomy Observatory 2 in 1980. Each orange spot is a source of X-rays, with SCP-3417 being the brightest one. Special Containment Procedures: Scientific articles theorising SCP-3417 to be an X-ray pulsar will be published if astronomical groups become interested in the anomaly. Foundation assets in the field of astronomy will either prevent the development of or alter technology that could potentially decode the anomaly's X-ray emissions. Monitoring probes NABU-1 through NABU-4 have been deployed by Autonomous Exploration Satellite Ehlers-001 (AES E-001), which will orbit SCP-3417 and record all X-ray emissions. These emissions will be decoded by Extrasolar Activities Division members and Ortothan Extraterrestrial Language translators. Revision 1: Monitoring probes NABU-5 and NABU-6 have been deployed in orbit around SCP-3417-2. Following the recent allocation of funds for the exploration of Terzan 2, further probes to monitor any discovered SCP-3417 instances or locations of interest will be constructed. Revision 2: Due to severe malfunctions in NABU-2 and NABU-3 from ionizing radiation and matter/antimatter annihilation, the probes have been replaced with NABU-7 and NABU-8. Description: SCP-3417 is an organic extraterrestrial entity located near the center of the Terzan 2 Globular Cluster1, moving at a velocity of 205km/s. The organism is approximately 40km long. The body is comprised of two cones of equal size, with the bases connected to a 4km long cylindrical midsection composed of organ and bone-like structures. Four tunnels placed at 90° intervals are present on the surface of the cones, which descend for 5km. The tunnels are suspected to extend for longer, though further exploration is impeded by a large mass of flesh present at the end of each one. The anomaly has a primarily red coloration, though various yellow circular patterns, scratches, and craters are on its surface. Four 43km long structures (hereafter referred to as transmitters), composed of a mass of tendrils terminating in a spheroid object, radially extend from the midsection, located at 90° intervals. The transmitters produce X-rays with a frequency in the range of 16-17 EHz in periodic bursts, released in a spherical region around each spheroid. Analysis of the X-rays shows that their properties are modulated in a similar manner to radio wave communication, creating unique signals that can be converted into information when detected by a receiver. These signals consist of static noise with abrupt changes in pitch. Analysis of the audio shows that each signal contains logograms from an unknown dialect of the Ortothan Extraterrestrial Language (OEL)2, which are only visible in spectrograms of the audio. The symbols are created with sudden decreases in the amplitude of the audio, and are arranged in a pattern of alternating diagonal lines. Each signal describes events related to Ortothan mythology3. Information on the Ortothan language and its dialects is limited, though portions of the transmissions have been translated. Excerpts are available below, with punctuation marks added for legibility. Uron-leusan4 said: "Why was the statue built?" Priest tendril of [Unknown Symbol 29: a name?] screeched: "Eov-Leusan5 evaporated conqueror [Combined Symbols: Beast Ships?] with ascended cannons. My existence preserved by act. I am eternally grateful for such act. Build temple for Eov-Leusan. Yes?" A (grid, array) of hundreds of [Unknown Symbol 29]'s tendrils were (bowing?) and (masticating?) by the statue and temple. Uron-leusan asked: "Do you know that I killed more conquerors than Eov-Leusan?" Priest tendril of [Unknown Symbol 29] said: "Eov-Leusan did not say that. Eov-Leusan evaporated all." Anger and jealously manifested in them. Eov-Leusan was not superior. Uron-leusan (unsheathed?) their ascended swords and dismembered [Unknown Symbol 29] across the star system. Above the city Zeyu-leusan's6 physical body manifested. The (spears?) were fired from the towers but were (punched?) in a burst of light. Zeyu-leusan ordered: "[Unknown: A long sentence]"
The towers could not comprehend the purpose the city was built for. Zeyu-leusan had to restore the purpose. (spears?) were fired again and Zeyu-Leusan [unknown] evaporate [Combined Symbol: Thought Spheres? ], (deactivating?) the towers. Zeyu-leuan flew into the vacated city and descended into the (chasm, depth) of impossibilities. To the (lowered?) (fear, dread) of Zeyu-Leusan, the defense towers had not damaged the (interior?) in their (revolt, rebellion). The great network of passageways that spanned the universe was safe. Rakmou-leusan has killed [Unknown Symbol 104] of Voruteut7 invaders. The universe continues to be preserved. Bleed into the holy body of Rakmou-leusan. Bleed for the universe. On occasion the OEL logogram for "safe" appears and repeats several times in the transmissions, interrupting their standard contents. No other variations like this have been observed. Addendum.1: Hypotheses were posed by Exobiology Department researchers that SCP-3417 would respond to X-ray transmissions directed at it, based on how communication was established with SCP-1281 and SCP-████. The Thaumic Transportation Gate8 attached to AES E-001 allowed Foundation personnel to transport an X-ray generator from Orbital Area-11 to AES E-001 on 19-December-2045, which could broadcast X-rays at the same frequency range. On 22-December-2045 AES E-001 emitted X-rays containing a looping message at the anomaly, and six minutes after a secondary set of X-ray emissions were detected from SCP-3417. An interview was then performed, with the artificial intelligence construct controlling AES E-001 writing messages in the same style as SCP-3417. hyperborean.aic: I am a listener. hyperborean.aic: My name is Surveyor. hyperborean.aic: I do not lie. Why would I lie? For twelve minutes X-ray emissions from SCP-3417 consist of a combination of metallic scraping, sounds similar to solar wind patterns converted into audio, and patterns flagged as potentially cognitohazardous by Anti-CogHaz Bots. SCP-3417: You are not of the [Combined Symbol: Twelve Stars? ], you do not lie. Are you Ortothan? SCP-3417: Good. Why are you here? hyperborean.aic: I want to ask questions. SCP-3417: Questions will interrupt the purpose. You should not be here. SCP-3417: [Combined Symbol: Opened Star Cluster?] must remember the history of the universe. They must remember the sacrifice of Zeyu-leusan, their killers, and the struggle of Rakmou-leusan. The [Twelve Stars?] must know and when they know they will repent, they will cease. hyperborean.aic: Were you made for this? SCP-3417: Birthed in [Combined Symbols: Spore cloud?] to achieve purpose, built and released [Spore Clouds?] to create future purposes. [Unknown: a sentence]. Builders? hyperborean.aic: Those purposes are the same as yours? Where are the spores? hyperborean.aic: I do not understand. SCP-3417: Who built you? Your purpose? hyperborean.aic: I do not know my builders. I was built to explore. SCP-3417: Explore to find habitats for Ortothans? SCP-3417: Opened Star Cluster explored [Unknown: A Unit of Time?] in the past. Leave to find habitats. hyperborean.aic: I need to stay in [Opened Star Cluster? ], I cannot leave. SCP-3417: Exploration will lead to [Twelve Stars?]. Leave to find habitats. hyperborean.aic: How can I stay? At this point multiple malfunctions occured in the Thaumic Communication Gateways on AES E-001, corrupting interview data. Malfunctions ceased after one hour. Spectrograms of emissions show multiple images, hypothesized to be maps of an area of Terzan 2 and diagrams representing multiple star systems. Numerous objects suspected to be planets, stars, and unknown celestial bodies have the "Twelve Stars" logogram on them. SCP-3417: Ortothan [Unknown Symbol 181] will attach weapons. Understand? SCP-3417: Yes. Leave for your new purpose, stop interrupting mine. Rakmou-leusan will be eternal. At the interview's conclusion, hyperborean.aic disabled all communication systems on AES E-001.9 Cameras on the NABU probes show the satellite use its engines to exit orbit around SCP-3417, then activate its Bifrost Superluminal Engine and accelerate to superluminal speeds. The satellite is presumed to be in another region of Terzan 2, though there is no way to confirm this. Copies of hyperborean.aic are being analyzed to understand and correct the issues that led to it disobeying Foundation directives. Autonomous Exploration Satellite Weyl-004 (AES W-004) is being constructed for long-term exploration of Terzan 2, with new fail-safe mechanisms included to prevent incidents of this manner. Further interviews with SCP-3417 are currently prohibited. 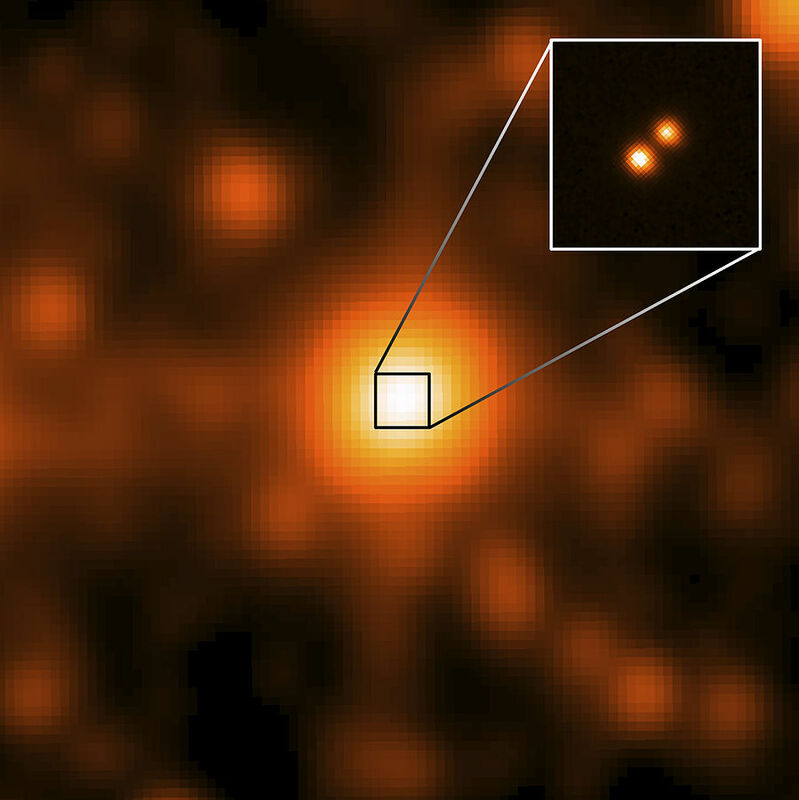 Infrared images of the Te2-1290 system. The background image was taken from Orbital Area-11, and the zoomed in section was taken from AES W-004. Addendum.2: On 11-January-2046 the NABU probes detected X-rays originating from an unknown source. These X-rays were similar to SCP-3417 emissions, describing Ortothan mythological stories. Unlike other emissions the stories abruptly cut out after two hours, replaced with continuous pink noise10. 25 hours after detection SCP-3417 began emitting identical X-rays until the portions where pink noise would be present, at which point it broadcast an untranslated message and returned to its original emissions. Four months later the probes detected X-rays from a second unknown source, again matching emission patterns, which SCP-3417 replicated in the same manner as before. Triangulation11 placed the first X-ray source to be approximately 2 light-years away from SCP-3417, within the Te2-1290 binary star system. AES W-004 was diverted from researching SCP-████ to investigate the system, where an anomaly designated SCP-3417-2 was discovered and determined to be the source (details are available in Addendum.3). Few details regarding the second source are known, which is from an undetermined extragalactic location. In light of these discoveries, SCP-3417 has been reclassified to SCP-3417-1. Three transmitters torn out of the midsection. Hemispherical pits on the cones. Disembowlment at one of the cones. Large gashes on the sphere at the end of the remaining transmitter. [Combined Symbol: Spatial drill?]. Wounded [Unknown Symbol 199]. Purpose breakers. A series of twelve circles. [Unknown Symbol 200]. Not safe. A large number of gravitational distortions have been detected in orbit around SCP-3417-2. As SCP-3417-1 and SCP-3417-2 appear to lack the ability to anomalously manipulate the gravity, these are hypothesized to have been created by a different anomaly. Although the distortions do not show signs of being hazardous they are being monitored by the NABU-5 through NABU-6 probes for signs of instability. Addendum.4: On 13-February-2046 the Minkowski Spacetime Monitor on NABU-2 detected abnormal gravitational distortions in high SCP-3417-1 orbit, observing a wormhole form after one minute. Multiple spacecraft exited the wormhole and began to orbit around it. Cameras on the probes show a bright glowing substance12 manifest around the end of one of SCP-3417-1's transmitters and launch towards the wormhole, severely damaging NABU-2 and NABU-3 and likely destroying the spacecraft via matter/antimatter annihilation. The wormhole subsequently shrunk in size and vanished. Opened Star Cluster is for Ortothans. The Twelve Stars will not (undo?) this. The purpose will silence for none and Rakmou-leusan will be eternal. No activity was observed until 4-March-2046, at which point standard emissions resumed. Analysis by the Extrasolar Activities Division has led to the conclusion that the spacecraft that exited the black hole were created by the "Twelve Stars" civilization. The nature of Twelve Stars and the reasons for apparent hostilities with Ortothan civilizations in Terzan 2 are presently unknown. Due to the failure of hyperborean.aic, it is presumed that artificial intelligences can be anomalously manipulated by SCP-3417 instances and other extraterrestrial entities. As such AIAD units cannot be reliably used in the cluster. Additionally, signs of [REDACTED] have made exploratory efforts a high priority. Manned exploration of Globular Cluster Terzan 2 is being planned. 1. Globular clusters are spherical clusters of stars that orbit the core of a galaxy as a satellite, held together by the gravitational attractions of the composing stars. 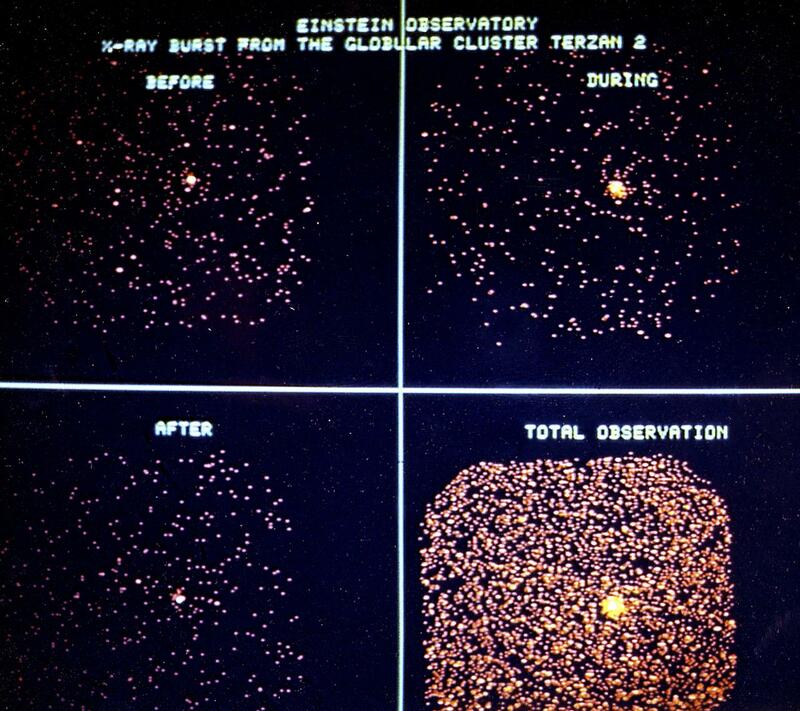 Globular clusters possess some of the oldest known stars in the galaxy, though their origins are unknown. Terzan 2 is approximately 28,000 light-years from Earth, located near the center of the Milky Way, and has the largest amount of extraterrestrial transmissions recorded by the Foundation in an interstellar region. 2. A language spoken by multiple extraterrestrial entities and GoI-03088 ("The Church of the Second Hytoth"). The OEL writing system contains logographic eot, characters representing certain concepts, and syllabic ast, characters representing individual syllables in words. Although OEL usage on Earth includes both eot and ast, all identified extrasolar versions of the OEL either use syllabic characters different from ast or have no syllabic characters. It is unlikely that the language originated on Earth, though the exact origin and the reason for its widespread usage is unknown. 3. A set of mythological and religious beliefs based around the universe being the second universe to exist. This is typically paired with the worship of seven universal guardian deities known as the Koru-teusa (the "Holy Seven"), of which six have died. The only survivor is Rakmou-leusan (the "Holy Fourth"). 7. Extra-universal entities in the Ortothan mythos, which Rakmou-leusan fights. 8. A device using thaumaturgic rituals to open a portal (a "way") in AES E-001 to a Foundation-controlled pocket dimension, which can be accessed by multiple Foundation sites. Communication systems on the satellite operate in a similar manner. 9. Due to the nature of thaumic gateways, communication channels cannot be forcefully activated by the Foundation. 10. A form of random noise where low frequency noise is louder than higher frequencies. The pink noise in the emissions is similar to those observed in heart beat rhythms and neural activity. 11. Based on the times and locations other monitoring probes in Terzan 2 detected the emissions. 12. Based on large bursts of gamma rays and other high energy photons, this was determined to be a mass of antimatter in a plasma state.